Hotel Vincci Gala is a four-star hotel with lounge, bar, restaurant, meeting rooms, different terraces and 78 rooms, located in an old manor building dating from 1914 in the Ronda Sant Pere of Barcelona, a quiet area of the city, next to the old town, characterized by large historic buildings of neoclassical style. 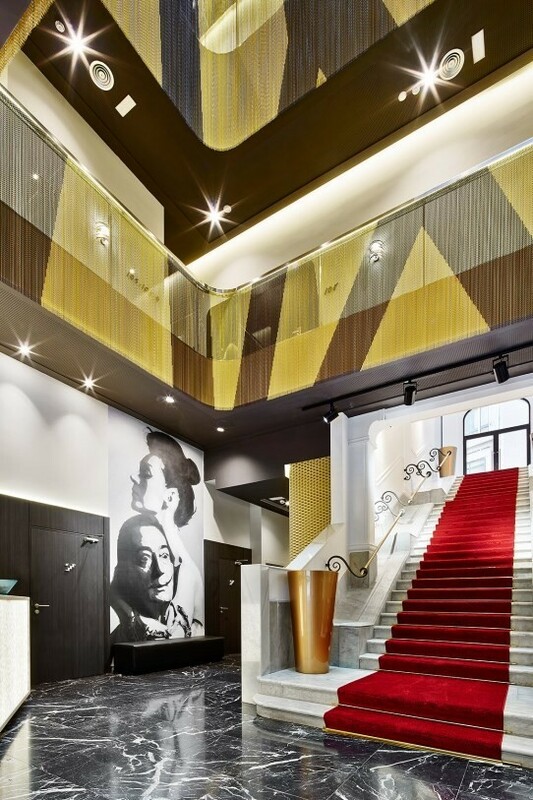 The golden colour is the great protagonist of this hotel that is repeated in different shades and applications both outside and inside the building, combined with organic forms and the contrasts of dark and luminous elements from the work of Dalí. The predominant material is metal as opposed to the stone and marbles of the original architecture. 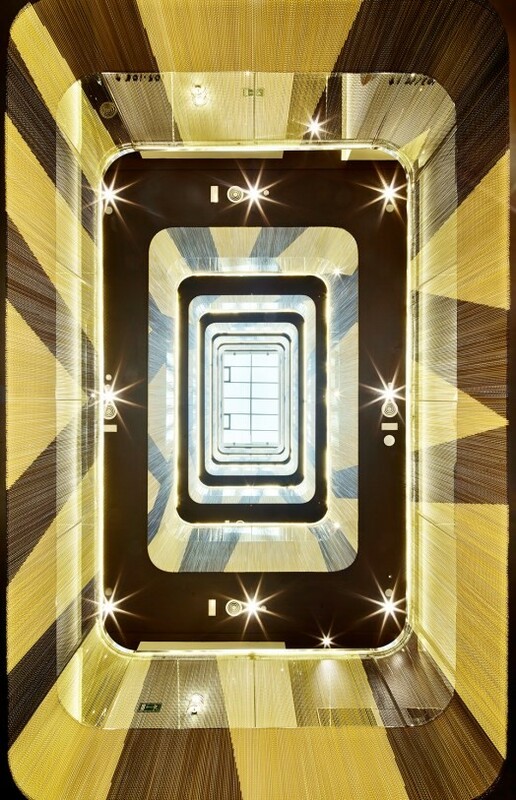 The heart of the project is the atrium of lights that connects the seven floors and allows to bring natural light to the interior of the building, including the ground floor. 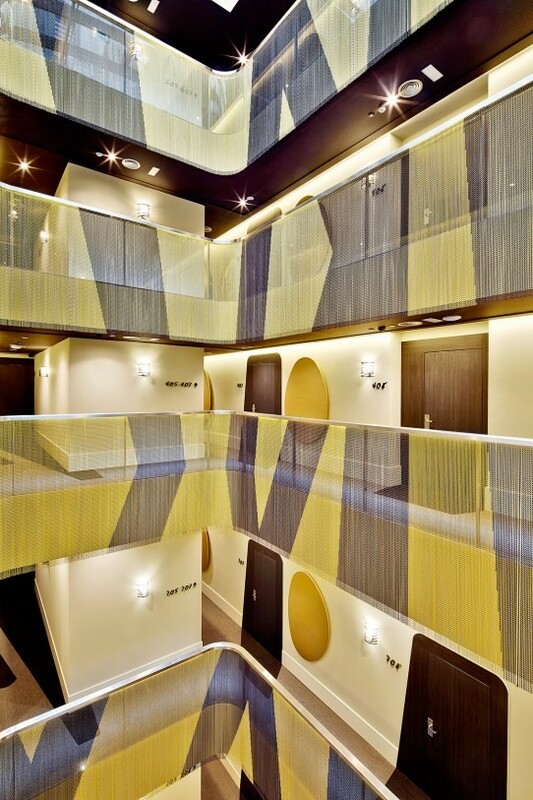 Like a large veil, golden aluminium chains hang in front of the railings and the edges of the false ceilings. A drawing of dark lines, integrated into the mesh of the chains and inspired by the organic shapes of Dalí's work emphasizes the vertical direction of the space and visually fuses the different sections in a single large space. The rail is made of laminated glass topped by a U-shaped profile of matt stainless-steel flush with the edges of the slabs, which provides a flat bottom for the chain veil. Lines of LEDs integrated in the handrails of the railings bathe each section of the chains with low light. This huge veil gives character to the atrium, lobby and all the spaces it crosses. 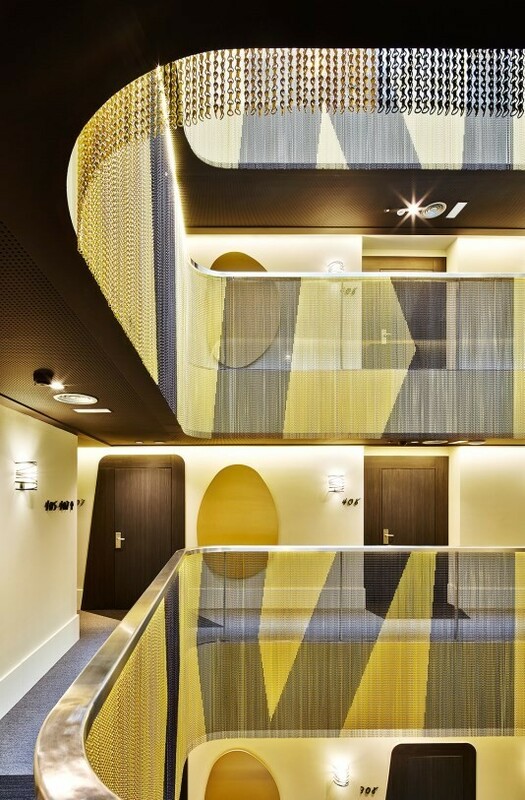 The superposition of the drawing of the chains with the doors of the rooms and the pavement of the corridors create the sensation of a virtual space with an environment characterized by light, transparency, reflections, texture and golden colour.